Michael Elliott is stirred from deep sleep by an early-morning dream—a beautiful woman leads him to the Pacific Ocean and whispers that the ocean will help him discover his true destiny. When Michael is then invited to Peru, he wonders if this is the path to that destiny. The journey of a lifetime, the energy of the majestic Pacific Ocean, a priceless philosophy for success and happiness, the sacrifice of a soul mate from Chicago, and the support of a special mate from India combine to make Michael the preeminent relationship coach for young people. Once he reaches that pinnacle, he is confronted with the most difficult choice he has ever made: in the pursuit of excellence, does sacrifice matter more than support; or without support, does no sacrifice count? Can Michael resolve this life-changing dilemma, discover his true destiny, and finally become The Suitable Inheritor? 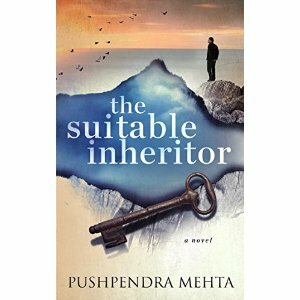 REVIEW- 'The Suitable Inheritor' by Pushpendra Mehta is one of the best book i read in 2016. Author has amazing ability of holding readers in one position hooked till the end. I loved the philosophy in the book. Book teaches readers some of the best life lessons in the best way possible. Book Title suits the content in the book. Book cover is beautiful. Man at the edge of ocean portrays one of important scene mentioned in the book. Blurb is okay and could be improved to increase curiosity. Language used in the book is simple yet inviting. Author has great narrating skills. With decent narration and lucid language it was impossible to put the book without reading cover to cover. Dialogs are short and crispy and makes story interesting. I loved the storyline and plot of the book. Scenes are described with utmost care and helps readers to visualize scenes from the book in subconscious mind. One liners and philosophy in the book is cherry on the top. This is the prime reason i read the book in one go. Character building was strong. Effect of characters on protagonist's life was written amazingly. Overall The Suitable Inheritor is one of the flawless, thought provoking and pure interesting book. Go for it, you'll not regret this one. You can grab your from the link given below.